There is no mention of Alan a Dale in any of the early ballads of Robin Hood. This character first appears in a seventeenth-century ballad called “Robin Hood and Allin a Dale”. In the ballad, Alan’s sweetheart is being forced to marry an elderly knight. Robin Hood, who has taken a shine to the lad, attacks the church on the day of the nuptials and obliges the priest to marry Alan to his own true love. Interestingly, there is a variation of this in the television series “Robin of Sherwood”. The writer Richard Carpenter features Alan in just one episode, a distraught and very bad minstrel Alan (played by Peter Hutchinson) is thwarted in his love for one Mildred, who is to be married (mostly for financial advantage) to the Sheriff of Nottingham. Unlike other series, this is just a one-off appearance for Alan. We never see him again. Elsewhere, in films and television, Alan is usually a mainstay character, often portrayed as a minstrel. Sometimes he appears as a bit of a dandy also. Occasionally a wooer of women to boot. As far as I recall he only appears a few times in the Richard Greene “Adventures of Robin Hood” series of the 1950s, where he’s played by Richard Coleman. When I was writing my Robin Hood novel “Loxley”, I decided to make Alan a rather more prominent character and give him some real back-story. Who is this minstrel? Where does he come from? Minstrels in medieval times were interesting characters. Unlike most people they could actually wonder from place to place. Or they might be rooted in one castle. Because of this they were sometimes employed as spies – a concept that I found that I could use in my stories. And what dale exactly does Alan come from? On the borders of the present day counties of Cumbria and County Durham, on the lonely moorlands of Stainmore, you may even today seek out a boulder that was supposed to be the trysting place of Alan a Dale and his lover. I haven’t been able to discover how this legend started out. So when I was writing “Loxley” I gave this background to my Alan a Dale, and I made him a minstrel in Nottingham Castle for good measure. A minstrel and something else besides. And there’ll be more of him in the next novel. The late Sir Angus Fraser devoted much of his life to the careful study of the writer George Borrow, seeking out new sources of information and dismissing many of the myths that had grown up about this much-neglected author since his death in 1881. Borrow had a great moment of fame after his book “The Bible in Spain” became a bestseller, before his star went into its first decline. His autobiographical novels, “Lavengro” and “The Romany Rye” didn’t acquire the popularity of his earlier work until after their author was dead. And then there was a kind of Borrovian renaissance, fuelled no doubt by the desire of so many to explore the British countryside on foot by generations of literary ramblers. This second flowering of Borrow’s reputation lasted roughly until around the 1950s. Since then George Borrow has been neglected again. Borrow wrote a really great walking book based on his travels, “Wild Wales”. Still to many readers the greatest book about exploring the Principality. But he undertook several other walking tours, and his notebooks suggest that he intended to write these up as similar volumes – sadly, he never did. But many of his notebooks remain and they give a very good indication of just how he made notes about his various expeditions. Even if you are not a dedicated Borrovian, these are quite fascinating. Sir Angus Fraser’s examination of the notebooks relating to Borrow’s tour of Galloway and the Scottish Borders, is now available in a splendid and lavishly illustrated limited edition of just 100 copies from The Lavengro Press, with a foreword by Dr Ann M. Ridler. It is sad that Borrow never had the will to create a book based on his travels north of the border. It would have made a significant contribution to Scottish topographical literature – and a waspish one too, for Borrow was not uncritical of some elements of Scottish life and learning. Only Borrow could admire and loathe Sir Walter Scott at the same time! At a time when the Victorians were embracing the cult of Balmorality and all the delights of Scotland – following the example of the Queen, and the huge late popularity of Sir Walter Scott’s romances – Borrow was looking at the same land with a much more jaundiced eye. Borrow arrived in the Borders on the boat from Belfast to Stranraer. He wandered on through Newton Stewart, Castle Douglas and Dumfries. Then by a circuitous route to Kirk Yetholm, and then into the heart of Scott country, Melrose, Hawick and Abbotsford. On then to Kelso before making for Edinburgh. The notebook entries reproduced here are quite fascinating. Not just snapshots of Scottish places and their history, but the people encountered. And Borrow is at his very best when describing locals and other travellers. For example, in the inn at Morebattle, he relates that there was ‘strange company’ – “old man master of the House – His sister 85 years of age – the maid – commercial traveller, in the grocery line – the man from (one undeciphered word) all drunk with the exception of the maid…” What grist to any writer’s mill! Borrow had a great interest in Gypsies and other travellers, so he included Kirk Yetholm in his itinerary, where dwelt the Gypsy Queen. Being Borrow he tried to catch her out on her knowledge of Romanes. This entertaining encounter did find a place in a chapter on Kirk Yetholm in Borrow’s Gypsy word book “Romano Lavo-Lil”. It is reproduced in this volume. Borrow was not just a reactive observer on his countryside travels. He very often throws out disputatious comments and often gets back as good as he gives. It was his nature to be challenging if not downright argumentative. To read Borrow is always entertaining, and there are some quite wonderful encounters in this book. It is in so many ways a tragedy that these brief excerpts of a journey were not worked up into a book on the scale of “Wild Wales”. For in these pencilled notebooks we have the foundations of what might have been a considerable work of travel literature. This reprint comes with some excellent appendices, featuring Borrow’s correspondence relating to his travels, much on Borrow and Gypsies, notes on his earlier Scottish tour, Borrow on Robert Burns, and Borrow in Belfast. An admirable collection not just for the ardent Borrovian, but for anyone interested in Scottish travel and topography. When we entered the world of independent publishing, it was perhaps inevitable that the first few books were about the British countryside, the outdoors and walking. I had, after all, spent decades as a freelance journalist writing for the outdoor press, and broadcasting on television and radio. Not to mention nine years as the chief executive of a campaigning countryside group. Over the past couple of decades I’ve written and published some thirty books for commercial publishers. From childhood I’ve been a great country walker, walking miles across the landscape, exploring the footpaths and bridleways, the moors and mountains, the meadows and coast. As a volunteer for the Ramblers Association I’ve been involved in protecting our rights of way, and taken part in many of the great environmental protests where National Parks have been threatened. Thirty years ago I spent an entire year living wild in a Dartmoor woodland, bathing every day in the Dart, waking with the dawn and sleeping with the dusk. I found this quite useful when I was writing my Robin Hood novel “Loxley”. As an inveterate trespasser I’ve long campaigned for better access to the British countryside. I’ve been evicted from country estates, and even been shot by a gamekeeper – an incident I’ve related in my book “The Compleat Trespasser”. And I’ve long been interested in the enormous influence country walking has had on English literature. My bookshelves positively groan with the weight of volumes brought about just because the authors enjoyed a ramble or a tramp. Many of our greatest novelists were considerable walkers. Charles Dickens was a noted walker, and a great observer, whether in the countryside or the town. The walker sees things that the non-walker can’t even begin to imagine. With the decline in markets for outdoor writers I decided to use these experiences to pen a few books on the countryside and walking. At first I considered putting these out with commercial publishers. But then I reconsidered. I wanted the absolute freedom to say the things I wanted to say. To take a position on countryside access. To be outspoken. All of those issues that add grey hairs to the heads of publishers’ editors. The first of the books was the most conventional. 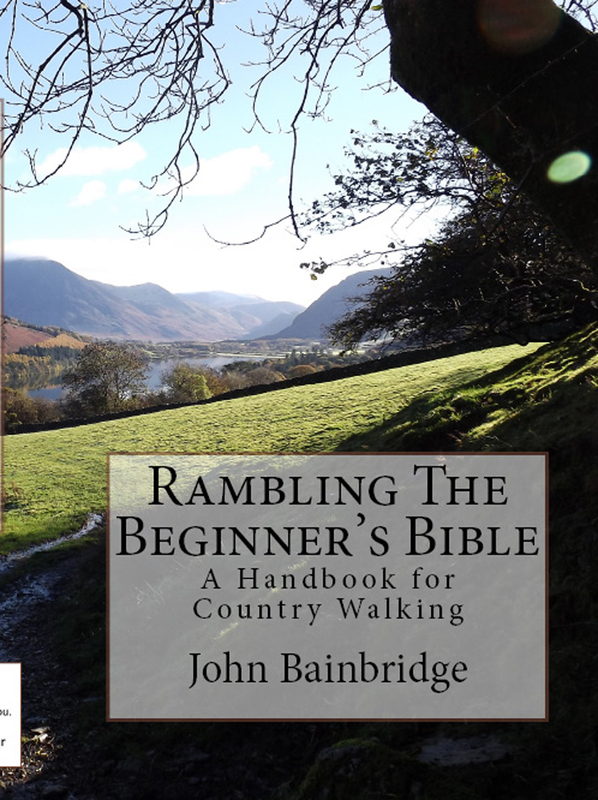 “Rambling – the Beginner’s Bible” is a guide to inspire the beginner, though I was pleased to see from the reviews that more experienced walkers have commented kindly on its contents. I hope it is of use if you have never really walked in the countryside, but want a bit of encouragement to find your feet. It assumes no knowledge of rambling at all. When this was done my mind wandered on to the thorny subject of trespassing and countryside access. I’ve always been interested in the Kinder Scout Mass Trespass of 1932, when five ramblers were sent to gaol for daring to walk in their own countryside. Appalled by the political trial they had to face with a loaded jury. But their imprisonment sowed the seeds that led to the creation of Britain’s National Parks and the Countryside and Rights of Way Act. The access movement of the 1920s and 1930s was what led to all of this. I found it dreadful that, in some cases, young men who had fought in the trenches in the Great War were being beaten up as they tried to walk across the country they had fought for, and their comrades sacrificed their lives for. Why is it considered okay to die for your country when you are forbidden access to some of its finest acres? I wanted to write a popular history of land access, a fascinating subject in itself. Here was my subject. 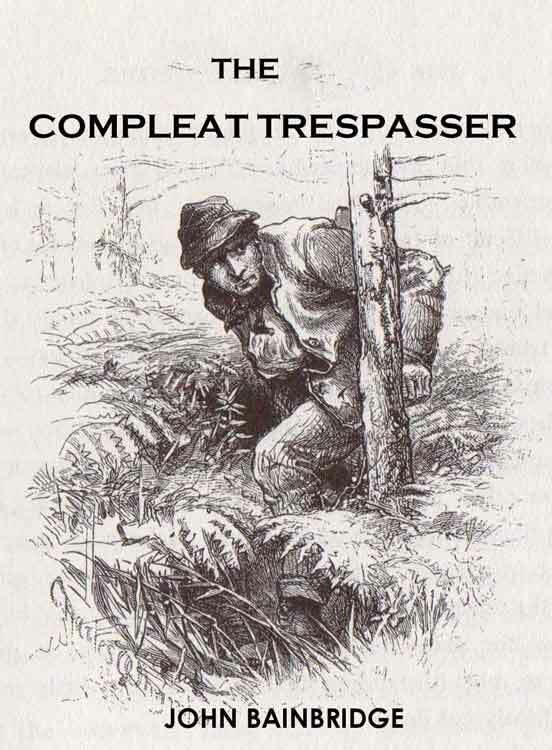 My book “The Compleat Trespasser” gives a history of these events from earliest times up to date. I also put in a few chapters about my own trespassing adventures. And for anyone tempted to roam off the highways, I’ve put in a chapter of guidance for would-be trespassers. My third country book is “Footloose with George Borrow”. This very brief book of essays is my tribute to the nineteenth-century’s most neglected writer. Borrow was a terrific walker and observer. His books resonate with the joy of the open road. Borrow’s Britain is a land of stagecoaches, footpads and highwaymen, Gypsy encampments and thimblerigs. To read George Borrow is to enter an entertaining and strange world that is often neglected these days. Walking in Borrow’s footsteps, either physically or in the imagination is a true delight! And are there more country books to come? Well, yes, I am working on one at the moment. A book of walking adventures. It might be out next year, though the novels, which are more commercial, have to come first. And thinking of writing a country book of your own? Please do. There is a market and reading outdoor books is a joy. You can order the books by clicking on the links below. “Rambling – the Beginner’s Bible” and “The Compleat Trespasser” are available as paperbacks and EBooks (Kindle, Kobo and Nook). 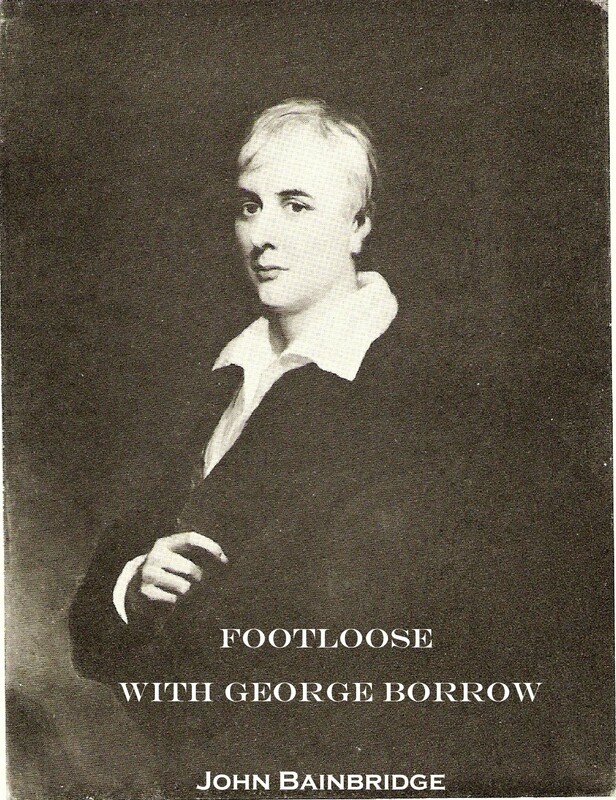 At the moment “Footloose with George Borrow” is only available as an EBook. Hope so. I hope to finish another Quest novel by the end of this year, though at present I am working on an espionage novel set in the 1930s. To order “The Shadow of William Quest” please click on the link below. Writing about Much, the Miller’s son. Much, son of the miller, has an important functionary role in many fictional interpretations of the Robin Hood story. It is by freeing Much, who has been caught poaching the king’s deer, that Robin Hood becomes an outlaw in the first place. I first became aware of the character in my “Robin Hood Annual” when I was aged about eight. It started the story with Robin rescuing Much from Gisborne, just before he was about to kill Much after the poaching incident. Variations on this original theme abound in novels, films and television series. Probably none of the merry men have enjoyed so many different interpretations as Much. In some versions he is young, in others quite old, or very often we see him as a middle-aged peasant. I don’t recall him played younger than in the memorable performance by Peter Llewellyn Williams in that iconic television series of the 1980s “Robin of Sherwood”. Here he is very young indeed. Peter Llewellyn Williams plays him as a simpleton, “a halfwit boy” in the words of one of the opposing characters. This Much is easily frightened, superstitious, loyal, and with, despite all of those problems, a courage that shines through in moments of great danger. Peter Llewellyn Williams gives a thoroughly convincing performance in what is a very difficult type of part. In “Robin of Sherwood” Much is shown as a kind of brother to Robin, Much’s parents having taken in Robin on the death of Robin’s rebellious father. The series starts with Robin Hood (Michael Praed) trying and failing to rescue Much from Gisborne (Robert Addie). In the original ballads, Much plays a more menacing role. He is just another outlaw in the pack, and certainly no relation to Robin. (It is interesting that if you look through the ballads, none of Robin’s men appear to have a family; the only relation who rates a mention is the Prioress of Kirklees who we discover is Robin Hood’s cousin.) Only, I believe, in “Robin of Sherwood” do we actually see the miller, the father of Much. Writer Richard Carpenter gave us Much’s mother too! The Much of the ballads is quite a skilled robber. And more than that, in at least one incident he is a murderer too. This is very true to the period. People driven to becoming medieval wolfsheads probably had to do a great deal to survive. Killing your victims was not so unusual. I hope to look at this aspect of the ballads in a future blog, when I’ll discuss aspects of being outlawed or made wolfshead. The murder that Much carries out is all the more vicious to the modern reader because he kills a child. In the ballad “Robin Hood and the Monk”, a manuscript version of which still exists, dating from 1450, Robin Hood is captured. He has been recognised by a monk who betrays him to the Sheriff of Nottingham. Little John and Much, on a rescue mission, encounter the monk and his page boy. To prevent the monk from acting as a witness against Robin, Little John “smotes off the priest’s head”. Much suggests that the monk’s page-boy cannot be allowed to live, in case he turns evidence against them. He then personally beheads the boy. Soon afterwards John and Much enter the dungeon where Robin is being held, murder the gaoler and set Robin free. The modern reader might be horrified at this sort of action, but it was all grist to the mill to the listeners of the original oral ballads, or those who read the early manuscript and later printed versions. These ballads appeared during bloodthirsty times. These scenes of violence were probably met with whoops of delight! All a very long way from the kinder morality of “Robin of Sherwood”. When I came to write my own Robin Hood novel “Loxley”, I spent a great deal of time considering how to portray the character of Much. It was hard to keep Peter Llewellyn Williams’ performance out of my mind. I decided therefore to go back to the original idea of an older peasant Much. An outlaw, even before Robin Hood arrives in Sherwood. I wanted a kind of Chaucerian character, not altogether pleasant, a singer of bawdy ballads, and someone who won’t hesitate to kill when it becomes necessary. Something closer to what a real-life medieval wolfshead might have been like. The least glamorous of Robin Hood’s followers. 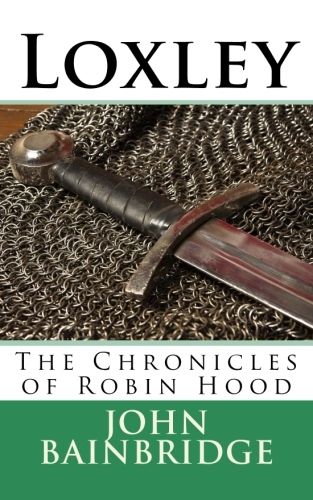 You can read the first chapter of “Loxley”, which gives the scenes where Robin Hood first encounters Much by clicking on the page above. Or click on the link below to order the book, either in paperback or as an eBook. 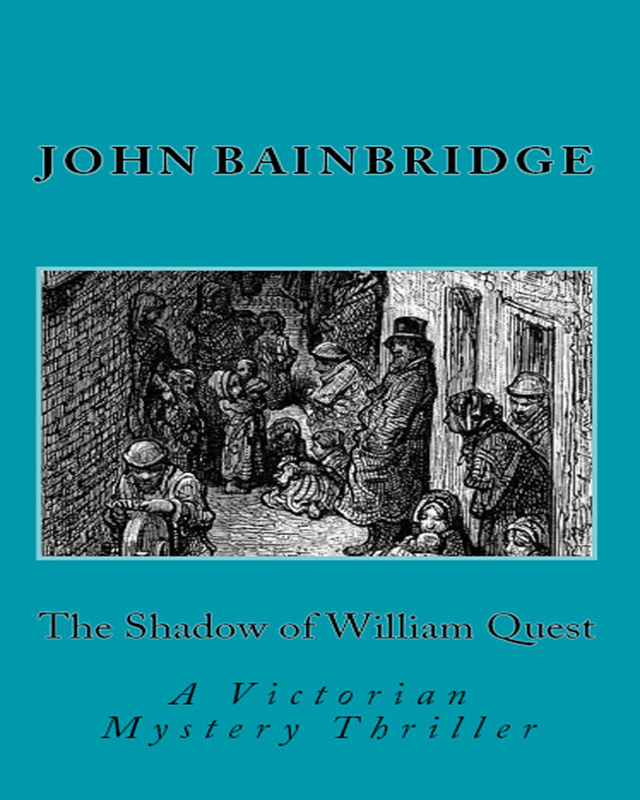 John Bainbridge read history and literature at the University of East Anglia. Apart from Balmoral Kill he has written the Victorian thriller The Shadow of William Quest, the historical novel Loxley – The Chronicles of Robin Hood and several books about the British countryside. He has contributed to a great many newspapers and magazines. As a writing team with his wife he writes the Inspector Abbs historical mysteries, so far A Seaside Mourning and A Christmas Malice. Balmoral Kill is available in paperback and on Kindle, Kobo and Nook eBooks. The need to seek revenge is an unpleasant but undeniable human instinct. Turning the other cheek might be the best real-life policy, but it simply won’t do in a thriller. The Bible tells us that “vengeance is mine, saith the Lord, I will repay.” Admirable, but not quite what thriller readers want to hear. I was much amused at a recent Amazon review of my Victorian thriller “The Shadow of William Quest”. The reviewer suggested he had seen it all so many times before. The poor boy making his way in the world and seeking retribution against those who had crossed him. Too right you have, chum! That was the whole point of my Quest novel. I deliberately set out to write a book in this very sub-genre of revenge thrillers. That’s what my William Quest book is really all about. It’s not for nothing my anti-hero is called William Quest. I was gratified that the reviewer saw, and mentioned in his review, that it was Bruce Wayne and Batman territory. A terrific compliment to be mentioned in the same sentence. Remember Batman? Bruce Wayne, a young lad at the time, sees his parents gunned down in an alley. When he grows up he becomes the caped crusader imposing his own version of justice on sundry villains. In a nutshell there you have the basic plot of a revenge thriller. It might be as blatant as Batman or rather more subtle. Geoffrey Household’s classic thriller “Rogue Male”, opens with the unnamed hero in pre-war Germany, aiming his rifle at Adolf Hitler. The first-person narrator describes his actions throughout much of the book as a ‘sporting stalk’ – to see if he can get away with it. He even denies ever intending to take the shot. Only later do we discover the revenge thriller aspect. That he had every intention of shooting. And that he has a good reason for doing so. In his later novel “The Watcher in the Shadows”, Household twists the whole premise around by telling the whole tale from the point of view of the victim of the avenger, a novel and very exciting twist. Another neglected novel well worth seeking out. Even going back to medieval ballads, we have Robin Hood. Why is he in the greenwood as an outlaw? Because the Norman overlords have put him there because of their harsh laws. Much of the rest of the stories of the famous wolfshead are about his quest for vengeance. In a way I made this easier for myself in “The Shadow of William Quest” by making Quest a kind of social functionary, taking on the evils – and the evil – of society on behalf of a wider and persecuted population. He only gets near to his real quarry at the end of the book. Though there are run-ins long before that. And as my novel is set in the 1850s, we don’t have to bother very much with the constraints of political correctness. This was the age of sword-sticks, lead-weighted life-preservers, bludgeons, coshes, and great hulking walking canes of hard-wood and blackthorn. Society was unsafe. People rarely travelled into the sinister hinterlands of Victorian England without some form of protection. My William Quest has quite an armoury at his disposal. Believe me, he needs every last weapon! So that when the cold revenge become the hot revenge, the thrills burst out of the page. 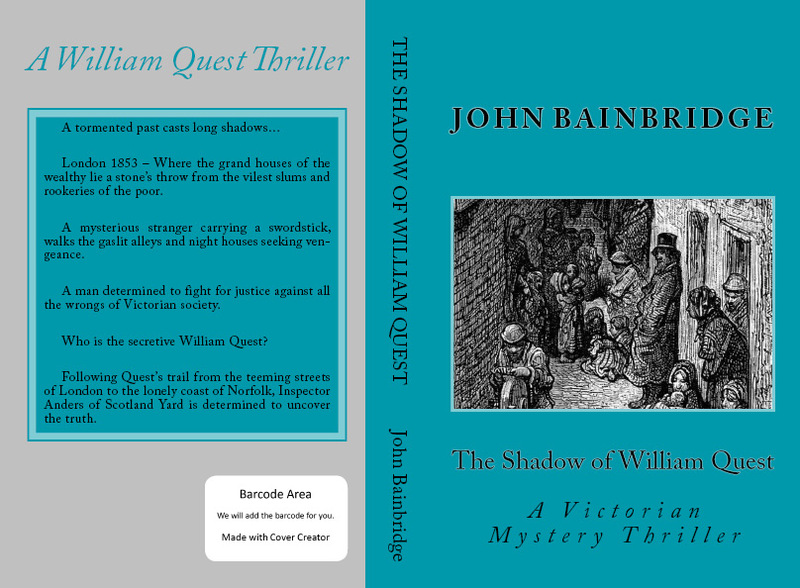 If you would like to try my “The Shadow of William Quest” please do click on the link. It’s out in paperback and for most eBook readers.